In total, Dolomiti Superski covers 50 ski resorts, with about 1,200 km of slopes and well over 400 lifts. There is no where else you will see this promise: Guaranteed snow on 840 km of slopes and 80% sunny days! 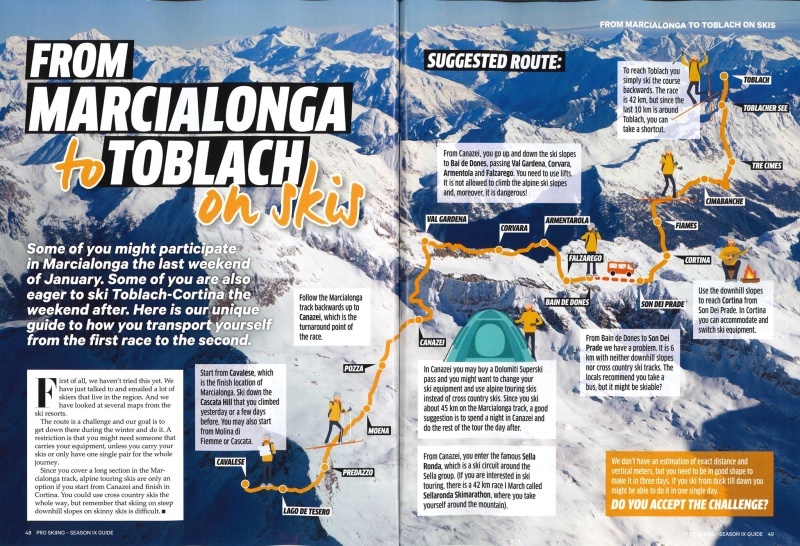 Last year, Visma Ski Classics published an article in their magazine Pro Skiing. They had made investigations whether it would be possible to move from one race to the next - on skis. No one had tried, but Globalrunners' CEO took the chance. It was a great way to transport yourself over the mountains. The route had to be altered compared to the one described in the article, but now we know how to take the perfect way in the Dolomites between Marcialonga and Toblach Cortina and we have added an extra clou. One part will be carried out by horse-lift and you will get the privilege to ski a 8,5 km long piste! In 2020 you are welcome to join us in an unfortgetable adventure! You will get your down hill equipment in Canazei and leave it in Cortina. We will transport your luggage (cross country skis and bag) on Monday eventing to Cortina. Date: Tuesday January 28, 2020 at 7 am. Meeting point: Hotel Central in Moena. Qualifications: You should be able to ski red slopes without any problem. Difficulty: No black slopes in case you don't take alternative slopes where possible. Insurance: You have to have your own insurance that covers down-hill skiing, medical costs, etc. Last day to apply (if not full before): December 31, 2019. Shuttle taxi service where it is not possible to go on skis. If you wish to stay in a Rifugio Tuesday - Wednesday at 2800 meters above sealevel with 360 degrees views over the magic Dolomities, we will arrange this at 50 Euro extra in a dormitory. Dinner at the Rifugio is recommended - wherelse would you eat? The dinner is an additonal 24 Euro and you will need a 2 day Ski Pass for the next day as well. You will never forget this experience and if you have the time, we do recommend it. One or more fields are not correctly filled in. The price is 250 Euro per person. We wish we could offer this day for free but with all the logistics with luggage transport, expensive Ski Pass, ski drop-off in Cortina, etc, this is the deal. It will be a unique day in your life! Everyone able to ski red slopes is welcome. 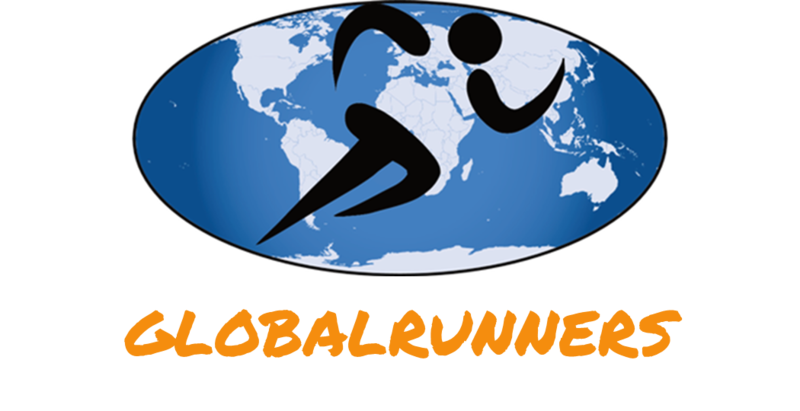 You do not have to participate in Globalrunners tours to Marcialonga and/or Toblach Cortina. Thanks for this fantastic idea. This can be the real future of skiing. Once in your life, you can come along and traverse the Dolomites from one race to the next - on skis. Going on flat ground or a little uphill with downhill skis is ... easier with the help of a horselift. 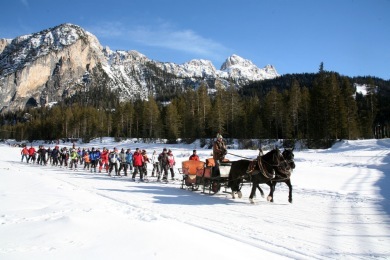 During the day from Canazei to Cortina, you will get some help from the horses in the Secret Valley during our Ski Safari from Marcialonga to Toblach-Cortina. 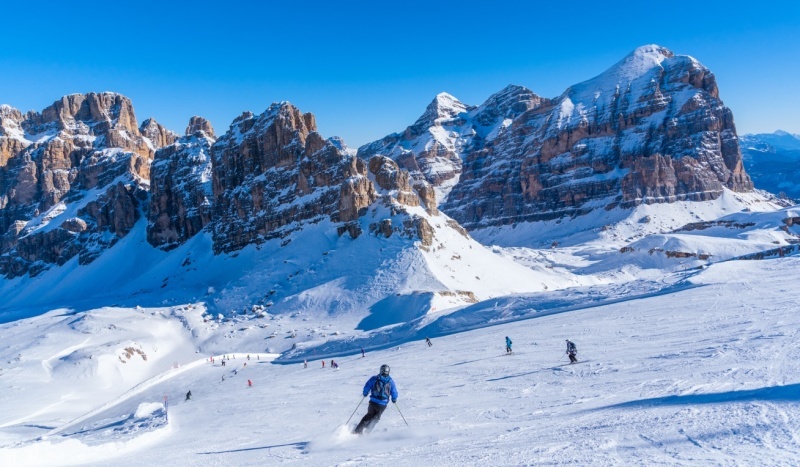 Dolomiti SuperSki is one of the largest down-hill ski areas in the world. A harmonious carousel with 12 skiing areas and state of-the-art lift facilities with a good 1,200 km of daily groomed slopes, and sunny slopes you just can’t wait to get your skis gliding over. You’ll be spoilt for choice, as there’s a slope for everyone: from the easiest one, for beginners following by ski instructors, to places of daring you’d never thought of going before. Simply amazing. The slopes are snowsafe with an altitude of 1200-3269 meters above sealevel. 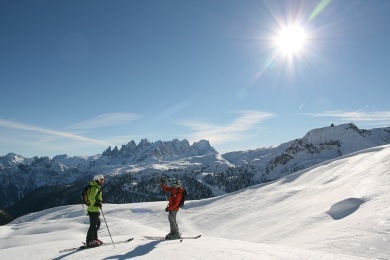 The unique “Sellaronda” is one of the most spectacular skitours in the world. It runs over the four Dolomite passes around the Sella massif. It passes through the Ladin valleys of Val Gardena, Alta Badia, Arabba and Fassa. In total, 40 kilometres of tours – 27 kilometres of those offer pure, unadulterated skiing fun. We will use parts of Sella Ronda during the Via Dolomiti Day. If you want to join us in 2020, don't wait too long to sign up for the tour! Price per person: 250 Euro. When you have sent in the filled in booking form, you will get a confirmation and an invoice of the price for Via Dolomiti which is 250 Euro. If you have to cancel the tour (for whatever reason) before December 1 in 2019, you will get your money back except for an administrative cost of 50 Euro plus eventual bank transfer costs if there are any. Cancellations after December 1 2019 for whatever reason are not refundable. A red star* means it is a cumpulsory field/question. Street, zip code, city and country. Please give us a phonenumber and name to one of your relatives or the like in case of emergency. I am not a robot The last question in this form is to avoid spam. Jag är inte en robot simply means I am not a robot. One or more compulsory fields were not properly filled in. 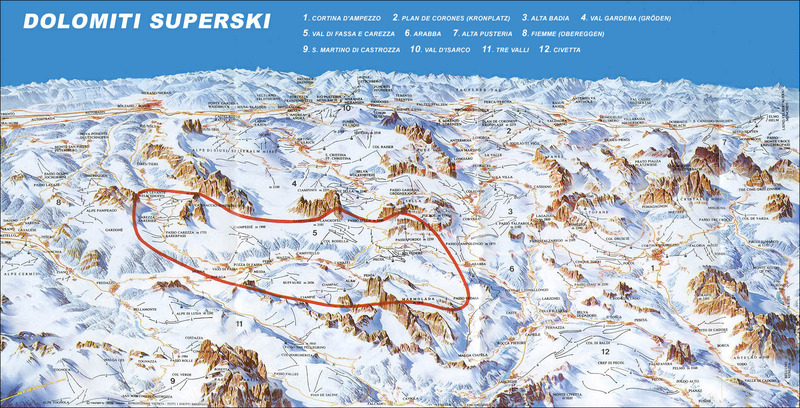 The huge area Dolomiti Superski's 12 areas. The red line is Sella Ronda.